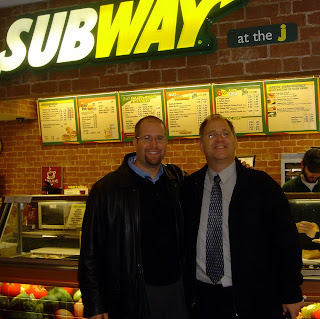 In June 2006 I wrote about the opening of the first kosher Subway restaurant in North America. I then had a chance to try it when I was in Cleveland later that year (with Rabbi Steve Weiss at left). It was delicious and a real treat to walk into a Subway and order a meatball and cheese sub (fake cheese of course!). Now, Subway has quickly become the largest kosher restaurant chain in the U.S. according to an article in the JTA this past August. Subway recently opened its ninth kosher franchise in a North Miami Beach JCC. By the end of 2009 there will be eleven kosher Subway franchises and five more planned for 2010. Dunkin Donuts has some 33 chains that are kosher, but they do not serve full meals there (only coffee, donuts, and breakfast sandwiches). In Metro Detroit, we have a kosher Dunkin Donuts, but no Subway restaurants. Rumors of a Subway franchise opening in the Jewish Community Center sprouted up several times over the past couple of years, but ultimately the deal fell through. Jerusalem Pizza, owned by Brian Jacobs, has taken over the space vacated by Matt Prentice Restaurant Group's Milk & Honey kosher dairy restaurant in the West Bloomfield JCC. Brian's new sit-down dairy restaurant at the Jewish Center is very good. Through my kosher certification, Kosher Michigan, I supervise a bagel and cookie bakery that recently opened its second location. Marty's Cookies and Bagel Cafe opened at the end of the summer in West Bloomfield. The two stores are the perfect synergy between the two owners. Josh Charlip, who owns The Bagel Factory, and Stacy Fox, who owns Marty's Cookies. As Stacy likes to say, "A balanced diet is a cookie in one hand and a bagel in the other." Stacy purchased Marty's Cookies many years ago from the founders Joyce and Marty Herman, my parents' long-time friends. Marty has since died (he was killed in a motorcycle accident), but I'm so happy that his name lives on through these delicious cookies. While I'm not sure that Jerusalem Pizza or Marty's Cookies & Bagel Cafe could quite be called a kosher restaurant chain, it is exciting that local kosher eateries in Detroit are expanding. In the recent issue of the New York Jewish Week, there is an article about the "chain-ing of kosher food." Is it a good thing? I think it's great! The kosher subway in Livingston, NJ lasted for about a year! Yes, Rebecca, that's true. According to the article in the New York Jewish Week: "Two kosher Subways have already closed (one in lower Manhattan and one in Livingston, N.J.), but with two slated to open this year and another five next year, the grand total will soon be 16." I just wish there would be such chains in France as well. My gut response to those objecting to Kosher Subways is -- are you out of your mind? it makes me sick to read this response, when I think of how little Kosher is available (i.e. just about nothing) in my town and almost every city in North America. Judaism is not a religion of masochism in my opinion, and the more welcoming the environment the better. Every observant Jew is so different in so many ways from the workplace to the school room to the weekends -- we don't need to be surrounded exclusively by trief restaurants to remind us of our differences. I'm not surprised that a Kosher Nathan's survives in Los Angeles, that city is Conservative Judaism Heaven in my opinion with great restaurants along with great Conservative and Orthodox congregations. And guess what, many of the kosher restaurants are so good they don't even have to say kosher on their signs to bring in clientele -- that to me is a true test. I was in Gaitherburg JCC over Sukkot and saw that they had a kosher Subway -- closed for Yom Tov but what a great thing to see. We certainly don't have a shortage or Kosher restaurants here in Skokie, IL, but people are still excited about the Subway that's opening soon.